Subaru's largest saloon and estate car offering has long offered buyers a practical, four-wheel drive car in a tough and reliable package. Subaru's largest saloon and estate car offering has long offered buyers a practical, four-wheel drive car in a tough and reliable package. Loved in agricultural communities in particular, the Legacy might lack the prestige of other four-wheel drive cars like Audi's quattro models, but that's arguably part of its appeal. It's a no-nonsense, good drive that feels like it's built like the farm's outhouse and is likely to last as long. This fourth generation Subaru Legacy was sold from 2003 to 2009, before it was replaced by a significantly revised version. You might see the car featured here referred to as a BL or BP model, the Legacy seemingly attracting the type of enthusiastic buyer who'd go to such detail as knowing such things. It's undoubtedly a bit of a left-field choice the Legacy, so it's unlikely you'll seek one out unless you specifically want and need one, which means there aren't that many about on the used marketplace. Its qualities are obvious though; it's good to drive in that way all Subarus manage to be, but it's a big, useful machine. That's defined by featuring both boxer engines (with horizontally opposed cylinders) and four-wheel drive. That means the centre of gravity is low, and the traction is good, which both make it enjoyable on the road and surprisingly capable off it. No surprise then that most Legacy models you'll see usually carry a substantial film of road grime and live in the countryside. The saloon is useful, though the wagon is even more so, Subaru also offering the 'Outback' model, which rides on higher suspension and wears pseudo-SUV body protection. None will excite inside unless you're partial to shiny, hard plastics, but the trade-off for this is the sort of durability that makes it feel like it'll survive the apocalypse. Engine choices were limited to 2.0-, 2.5- and 3.0-litre petrol units until 2008, and then Subaru upped its appeal and utility further by adding a 2.0-litre turbodiesel. It, like those petrol engines is a boxer unit. The 2.0-litre diesel is unquestionably the most appealing, but its rarity means it's difficult to recommend to all but the most patient and committed buyers. The 2.0-litre petrol is the best all-round choice then, largely down to availability, but also running costs. The bigger engines are rather expensive to fuel and tax. Saloons are fine, but the wagon is more useful. 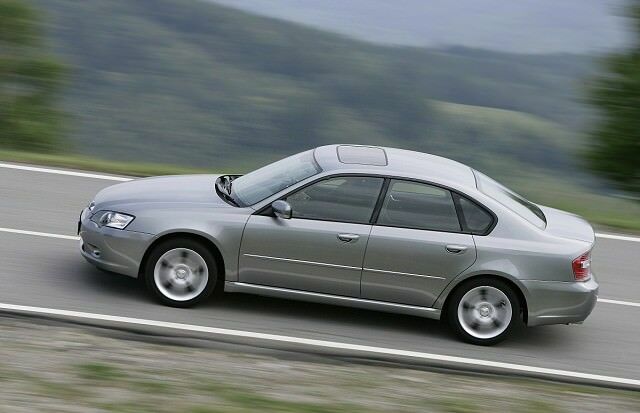 The Subaru Legacy appeals to a specific type of customer, typically one who'll appreciate its robust drivetrain. They're surprisingly fun to drive, though all - even that diesel - do consume a good deal of fuel.